The Carbon Filter also contains enhanced active carbon which is recommended for use in rooms where heavy gaseous pollutants such as cigarette and cigar smoke and other VOCs (volatile organic compounds) such as most household paints, are present. CLEAN AIR is a Human Right! Everyone deserves to breathe clean air, and now you can too with BlueAir. BlueAir’s patented HEPASilent™ technology removes up to 99. 97% of impurities from large volumes of air silently and efficiently. Our non-toxic filters contain millions of ultra-thin fibers that trap tiny particles as they pass through the BlueAir system. 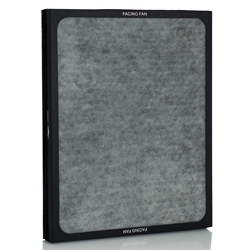 While glass or paper filters are brittle and can splinter (releasing more particles into the air), BlueAir filters are made out of more flexible polypropylene. Polypropylene is naturally hydrophobic, so it inhibits bacteria, viruses and mold. Because we care about the environment, and know you do also, Blueair designed thier filters to convert into harmless carbon dioxide and water when they are finally discarded and decompose. Choose from a single or a three count with FREE SHIPPING below. My blueair with the carbon filter keeps my office clean an odor free. The free shipping from vacshack is an added bonus.